Home » Can't Import GoPro Hero 6 Footage to FCP X, Solved! The GoPro Hero6 Black gets a major update with 4K 60fps and super-slow-motion Full HD 240fps video. These, along with improvements to image quality, faster transfer speeds and smaller file sizes make this the new best action camera. But the problem is that GoPro Hero 6 videos can't be imported to Final Cut Pro X for further editing. After searching online and our multiple testing, some possible solutions turn up. Now I will share the best method to import and edit GoPro Hero 6 footage in FCP X flawlessly. "I am trying to import 240 FPS footage shot using GoPro Hero 6. I am able to play the file using QuickTime, even though for some reason it plays back in slow motion like the one shot with an iPhone. When I try to import those files FCP X won't let me select the 240 FPS files to import. Had anyone encountered this problem?" "Hello, I am having issues importing videos from my new GoPro Hero 6 (4K @ 60fps or 1080 @ 240fps). I see the file imported but can only hear audio. The video is imported as black only. I have been able to import it on the GoPro QUIK app as well as iMovie and the video shows up there. I'm wondering when FCPX will have support to HEVC correctly when it comes to the hero 6. Thanks! Note - I have macOS High Sierra on my Mid 2015 MBP." Refer to the video editing, the most basic decision you need to make is what's the best video format for FCP X editing, so that you can finish your GoPro Hero 6 video editing work easily. Broadly, you can import the following video and audio formats in Final Cut Pro X for editing. An unbounded video editing in Final Cut Pro also depends on the settings besides the file formats FCP support. If you know what are the best audio/video settings your Final Cut Pro support, you can get a better result for editing in FCP. Below is the recommended audio and video specifications for you to learn the best video format for Final Cut Pro. Resolution: You can choose different resolutions, all the way to 5K. The lowest resolution supported is 640 x 480. You cannot choose custom resolutions or aspect ratios. Frame Rate: The lowest frame rate possible is 23.976fps, and the maximum is 60fps. No 12 or 18 fps options. Audio Settings: Generally, audio only has 'Surround' or 'Stereo', and the maximum audio bit depth isn't specified. Squence audio is always mixed using 32-bit floating-point values. As we know, GoPro Hero 6 records high resolution and high FPS videos with the new HEVC/H.265 codec, while FCP X doesn't support H.265 codec yet and the frame rate of your source video is limited to 60fps. In a word, to be able to work with GoPro Hero 6 240fps HEVC/H.265 files in FCP X, you will need to convert them to a format that is compatible with FCP X first, such as Apple ProRes codec. Here, Pavtube Video Converter for Mac (Review) will help you solve all the video/audio incompatibility issues once and for all. 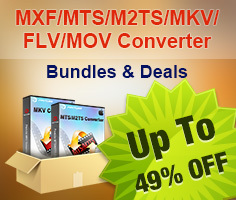 With 250+ video and audio codecs supported, this video converter for Mac (macOS High Sierra supported) can convert any video to the best video format and codec for Final Cut Pro X, so that you can import your camcorder recordings, YouTube videos, or TV shows to FCP X without any problem. What's more, you can even do some video editing work with its built-in video editor, and many more to suit your diversified needs. How to Transcode GoPro Hero 6 Footage for FCP X Editing? Run Pavtube Video Converter for Mac, and load GoPro Hero 6 video files into it from “Add video” or choose “Add from folder” button which allows you to do batch video conversion. You don't worry about the video converter interruption issue. Click "Format"bar, from its drop-down list, select FCP X best supported Apple Prores codec as the desired output file format. 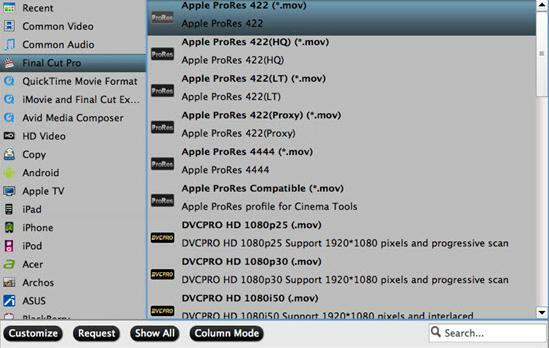 For online high quality editing on high performance computer, it is ideal to choose "Final Cut Pro"> "Apple Prores 422(*.mov)" or "Apple Prores 422(HQ)(*.mov)", for offline editing on slow performance computer, "Apple Prores Proxy)(*.mov)" or "Apple Prores (LT)(*.mov)" is recommended. Hit the Convert button under the preview windows, the program will start GoPro Hero 6 footage to Apple ProRes MOV conversion for Final Cut Pro X.